Golix, Zimbabwe’s first and largest cryptocurrencies exchange, has broken new ground once again by acquiring the country’s first ever Bitcoin ATM, which comes loaded with hard US dollars. The machine – which was activated earlier this week – allows anyone to buy and sell bitcoin at favourable rates using the greenback. It is the only ATM in Zimbabwe dispensing US dollars to customers selling bitcoin. Through an easy-to-use interface, it provides tech and cryptocurrency newbies a simple way to buy bitcoin. It has been placed in Golix’s Customer Support offices which are located along First Street Harare – one of the busiest streets in the capital city’s business centre. Thanks to Golix’s ATM, Zimbabwe joins an elite score of fewer than 70 countries around the world that have introduced the machines which provide convenience to customers, especially first time users of cryptocurrencies and the unbanked without access to digital funds. The development is not only significant for Golix but also for Zimbabwe. Just a decade ago the Southern African country recorded the highest rates of hyperinflation in modern history, turning virtually every citizen into a trillionaire and rendering normal banking services like ATM withdrawals pointless. The adoption of a foreign currency system in 2009 halted the effects of inflation, but in the past two years, the country has suffered from a new problem altogether. A cash crisis has gripped the formal financial system, resulting in unending bank queues and leaving the country’s 472 ATMs network useless. As such the Bitcoin ATM serves to be a financial game changer in a country that has no fiat currency of its own. In the same way that customers insert a card into a traditional ATM, the Bitcoin ATM allows customers to insert US dollars which are converted to the volume of bitcoins that they want to buy. The ATM then sends the bitcoins straight to the customer’s wallet. Customers who purchase bitcoins without a bitcoin wallet have the option to generate a bitcoin address. Golix product manager, Yeukai Kusangaya, said that the bitcoin ATM was one of the many products lined up to ensure that the public has easy access to bitcoins. 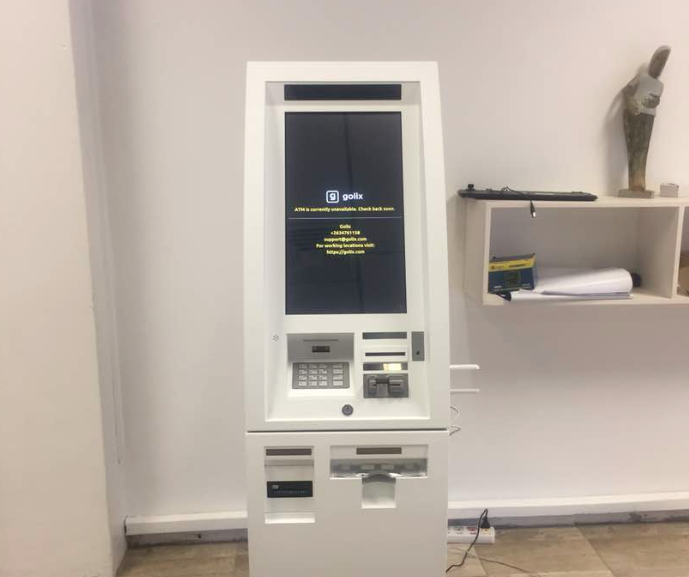 “After realising that the public is still struggling to understand or in some cases access bitcoin, we felt that the bitcoin ATM would be a huge and necessary step towards engaging people on how they can use cryptocurrencies for their daily business. “For anyone who has used a traditional ATM, they won’t struggle to find their steps when they are using the Bitcoin ATM,” said Kusangaya. Also weighing in, Golix CEO, Tawanda Kembo said that this is the only ATM in the country with cash.